Three first half goals were enough to give Churchvilla a 3-2 triumph over Dunbar Celtic in the final of the Murphy’s Stout Saxone Cup at Turner’s Cross last evening. Just enough, as Dunbar powered back in the second half, scored a couple and hit the bar in injury time. Both sides played attacking football and were a credit to the second division. Both missed some good chances in the opening twenty five minutes. Billy Donovan came close to putting Villa ahead with a header from an 8th minute corner and then Dunbar’s Ian Riordan was within inches of turning the ball in after a throw-in had been flicked on. Churchvilla, with the strong wind behind them, took the lead in the 27th minute when a well hit free by Martin Curtin hit the ground before keeper Danny Daunt, with the setting sun in his eyes, could kill it off and it squirted through to the net. Dunbar’s Gary Tobin tried his luck with a similar free in the next minute but excellent Cloyne keeper Martin Cremin saved well. Villa came close to making it 2-0 on the half-hour when skipper Dean Wilson robbed Daunt but, with Kevin Lomasney waiting for a cut-back, he rolled his shot wide. Conor, Kevin's brother, had better luck three minutes later. His close control tempted a Dunbar defender in the box and referee Keith Callanan, who had his father Ted as assistant, pointed to the spot and Donovan obliged to put Villa two up. The first half got even worse for Dunbar when they went three down in the 38th minute. Cremin’s long clearance fell for Kevin Lomasney and he outmuscled his marker before hooking the hopping ball over the advancing Daunt. Dunbar manager Paul Walsh refused to panic and sent out the same eleven for the second half. The wind had died down but that didn't prevent a gallant comeback attempt, indicated by a corner count of 9-1 to the city side. Cremin would have a busy period. In the 56th minute, he made a great save from Riordan, who had been played through by Walsh, and then watched with relief as Chris O’Sullivan's curler from the rebound sped just wide. Then Cremin made a brave save at the feet of Walsh, who broke clear after a fine sweeping move, before being beaten in the 63rd minute by a Keith O’Neill free kick, again with the low sun behind it. Churchvilla, who lost to Tramore Athletic in the 1995 final, were coming under increasing pressure and giving away free after free. They were largely confined to their half but did break away in the 66th minute. Sub Tony Barrett got free on the right and his quickly delivered cross was met by fellow sub Jason Browne but his 18 yarder was well over. Dunbar though weren’t making that many clear chances themselves. They did come near in the 76th minute when O’Neill set up O'Leary for a shot that was well parried but Scott Crowley failed to find the net with the loose ball. For all their possession, Dunbar’s second didn't come until the second minute of injury time when Walsh slipped Crowley in to slide the ball past Cremin. There would be six minutes of additional time in all and, in the 4th, Walsh headed on after a thrown-in on the right and sub Ross O’Callaghan let fly but his shot came back off the bar and that was the last chance for Celtic and Churchvilla held on to take the trophy for first time. Churchvilla: Michael Cremin, Dean Wilson (captain), Martin Curtin, John Cotter, Billy Donovan, Dwayne Power, Emmett O'Brien, Shane O'Brien, Kevin Lomasney, Conor Lomasney and Kevin Eaton. Subs used: Jason Browne for Eaton (34th minute), Tony Barrett for C. Lomasney (62nd) and Barry Mulcahy for Donovan (72nd). Dunbar Celtic: Danny Daunt, Gary Tobin, Ian Cotter (captain), Chris O’Sullivan, Wayne O’Donovan, Keith O’Neill, Ian Riordan, Jonathan Quinn, Paul Walsh, Scott Crowley and Craig O'Leary. Subs used: Michael O’Connor for Riordan (68th minute) and Ross O’Callaghan for Quinn (83rd). 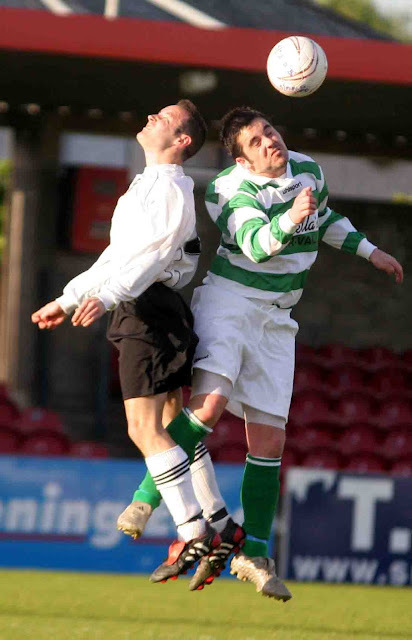 Referee: Keith Callanan. Assistants: Frank Murphy and Ted Callanan. Thursday, June 2. Ko. 7pm. Premier A relegation play-off: Greenwood A v Knockraha, Leghanamore, 7pm, Ray Murphy. Corinthians Cup Semi Final: Lakewood Ath 3 Greenmount Rangers 0. 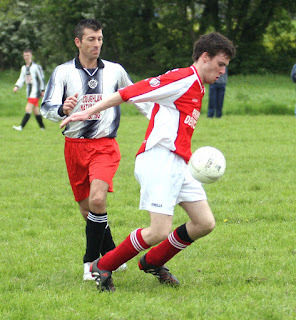 Premier A League: Knockraha 0 Glen Celtic 3; Cathedral Celtic 6 Dillon Cross Ath 6. 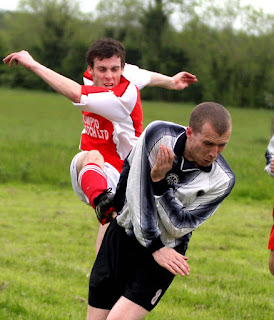 AUL 2: Hibernians 1 Glenthorn Celtic 1; Carrigtwohill Utd 3 De Courcey Albion 2. 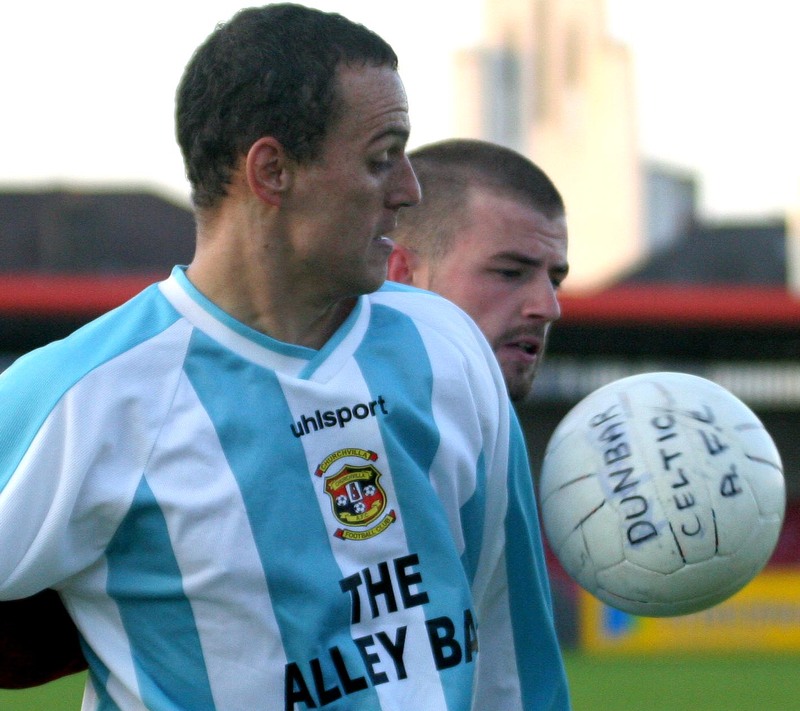 AUL 3: Castlelack 1 Parkview Celtic 1; Blackpool Celtic 1 Donoughmore Ath 3; Strand Utd 2 Los Zarcos 3. AUL Results for Thursday 26th May. 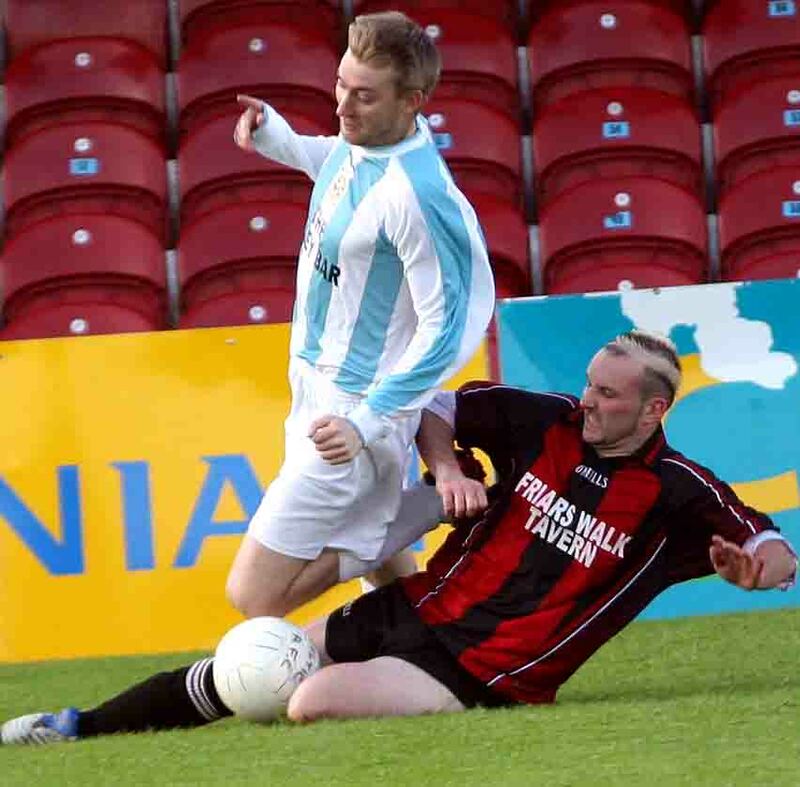 Premier League: Pearse Celtic 0 Park Utd 3 (Park United are champions). 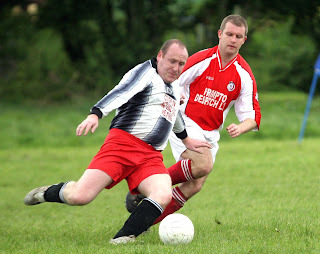 Premier A League: Macroom 3 Dillons Cross Ath 3; Glen Celtic 3 Innishvilla 1. AUL 1: Bohemians 3 Fairview 3; Waterloo 1 Buttevant 1. 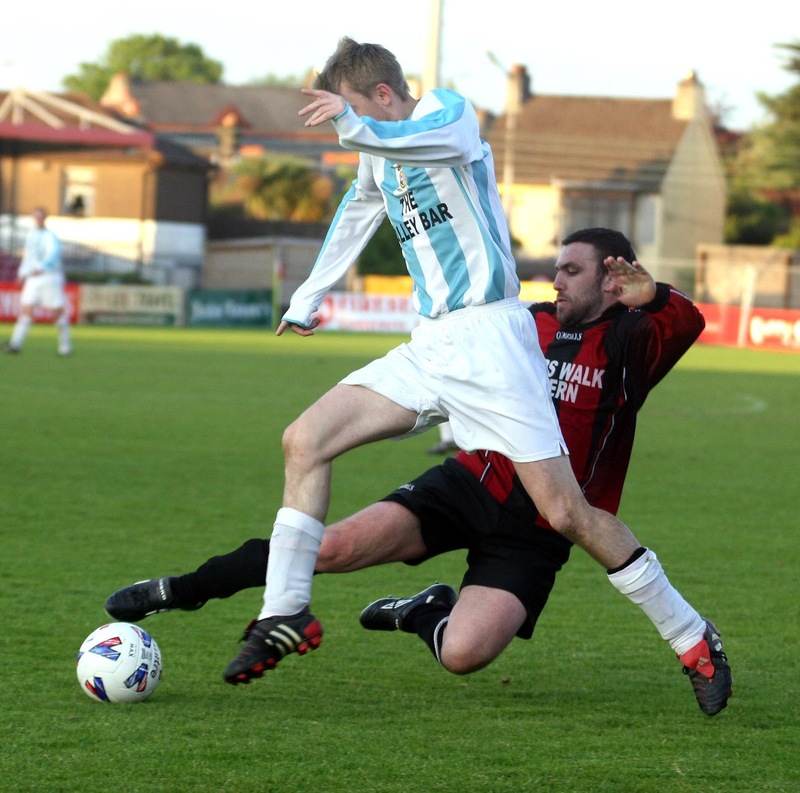 AUL 1A: Knocknaheeny Celtic 0 Lakewood Ath 2; Leeview Ath 8 Strand Utd 1; Greenmount Rangers 1 UCC 5. AUL 2A: Newmarket Town 2 Tower FC 4 (Tower are champions); CFC Banteer 4 Corkbeg 3. 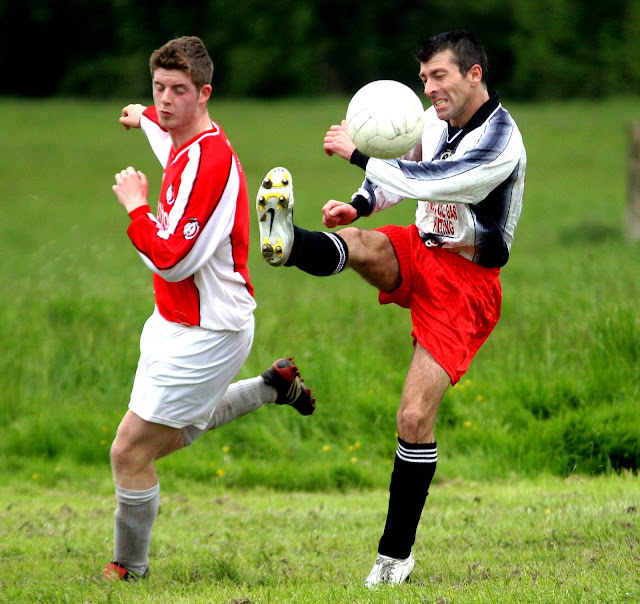 Applications are invited for the position of Premier Team Manager of Grattan United FC playing in the Cork AUL. after being tackled by Mark Buckley. Springfield won 4-3 on pens. Springfield's Conor Hawes heads away from Trevor O'Mahony (left). 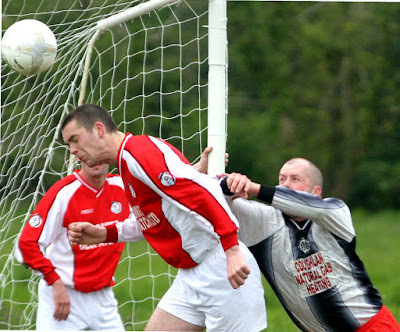 County Cup final, Turner's Cross, 30.05.06, Ballincollig 0 Springfield 0, Springfield won 4-3 on pens. AUL Results for Wednesday 25th May. 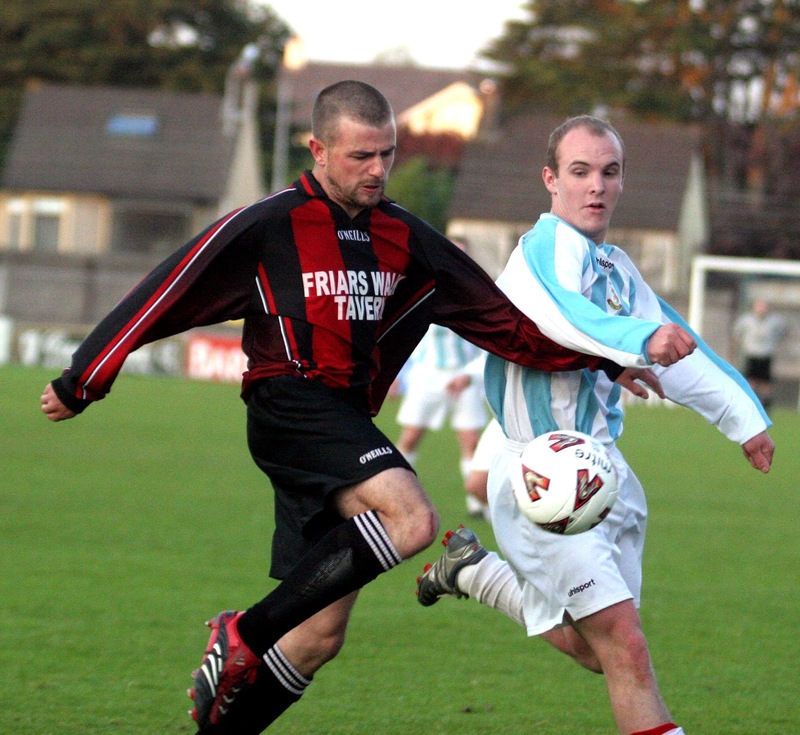 AUL 2: Glenvale 3 De Courcey Albion 0; Grangevale 3 Innishvilla 2; Hillington 4 Carrigtwohill Utd 2. AUL 3: Macroom 1 Ballinhassig 2; Los Zarcos 2 Ard Na Laoi 2; Parkview Celtic 2 Greenwood 3; Castlelack 1 Donoughmore Ath 2. AUL 3A: Grattan Utd 0 Pearse Celtic 3. Saturday, May 28. Ko.2pm unless otherwise stated. Corinthian’s Cup Semi-Final: Lakewood v Greenmount Rangers, Ovens, M. O’Flaherty. Sunday, May 29. Ko. 10.45am unless otherwise stated. AUL 2: Carrigtwohill United B v De Courcey Albion, Ballyadam, M. Doody. Monday, May 30th. Ko. 7pm unless otherwise stated. 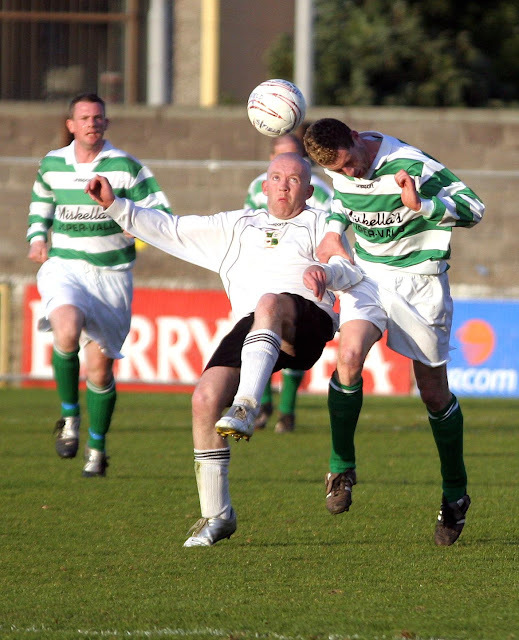 Corinthian’s Cup Semi Final: Hibernians v Bohemians, Shanbally, Shanbally, D. Cronin. AUL 1: Waterloo v Bohemians, Whitechurch Community School, K. O’Keeffe. AUL 2A: Waterloo v CFC Banteer, Whitechurch Community School, P. Hennessy. Thursday, June 2. Ko. 7pm unless otherwise stated. AUL 2A: Waterloo v CFC Banteer, Whitechurch Community Centre, P. Hennessy. Saturday, June 4. Ko. 2pm unless otherwise stated. AUL 1: Waterloo v Bohemians, Whitechurch Community Centre, K. O’Keeffe. Corinthians Cup Quarter Final: Hibernians 3 Tower FC 1. 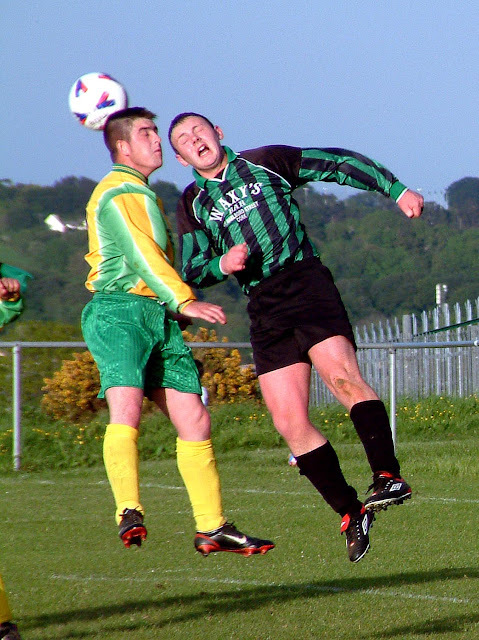 Premier League: Kilreen Celtic 0 Park Utd 0. Premier A League: Springfield 4 Cathedral Celtic 0. AUL 2A: CFC Banteer 6 Watergrasshill Utd 0. 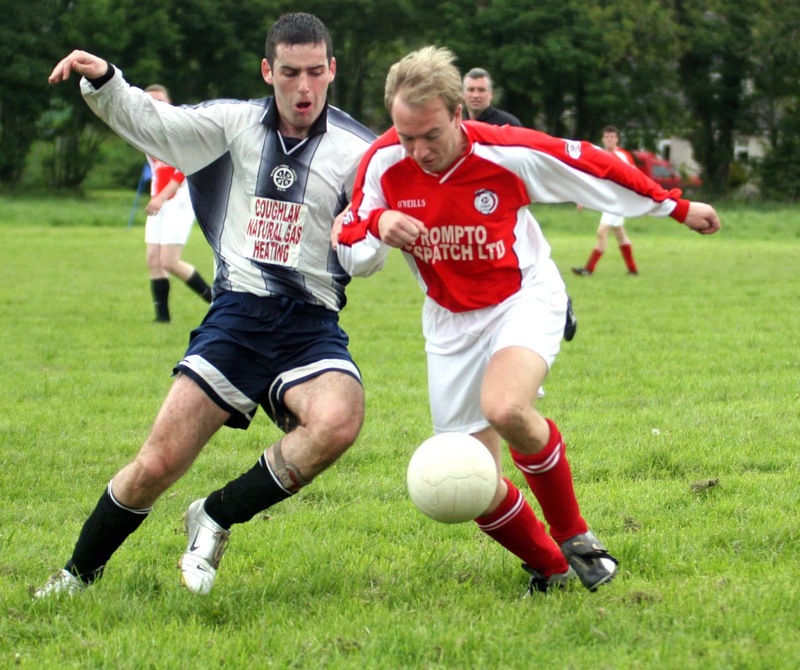 Corinthians Cup Quarter Final: De Courcey Albion 2 Bohemians 7. Premier League: Coachford 2 Grattan Utd 2; Pearse Celtic 4 Carrigtwohill Utd 4. Premier A League: Rylane Celtic 3 Macroom 1. AUL 1: Buttevant 1 Crescent Ath 0. AUL 1A: Leeview Ath 4 Richmond 2. John Dorgan’s early strike and then a determined defensive performance helped put visitors Watergrasshill United into the semi-finals of the Murphy’s Stout Corinthians Cup at the expense of Blarney Street Athletic at Monard on Sunday morning. In fact, neither side reached any great heights in a poor game. While the Street did most of the attacking, they found the Hill defence up to the challenge. 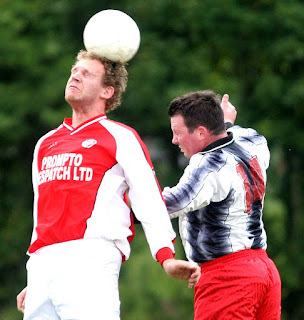 Keeper John O’Keeffe is not the biggest but he is sharp and alert and quite brave. That back four took everything Blarney Street had to offer for half an hour after the goal but then suffered a big blow when Moss O’Keeffe limped off injured. They were vulnerable then and for the first 15 minutes or so of the second half when the home team more or less camped in the Watergrasshill half. But the Hill mentors then made a master switch. Donal O’Shea was brought back to play in the centre of the back four and Kieran O’Callaghan was once again free to play at right back. Hill immediately settled and the lively Garry Coughlan, who had been darting forward on the left and setting up chances for the Street, now found his way blocked and was regularly seen working back in midfield. Watergrasshill’s big improvement after the switch didn't mean that the Street were out of it. 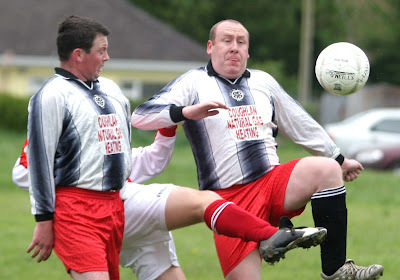 One goal is never enough and veteran Ger Cronin tried everything as they sought that elusive equaliser. But Hill were steadier now. Willie O'Leary stuck out a long right leg as he halted promising attacks and when the Street did get through keeper O'Keeffe was not to be beaten. The winners rode their luck from time to time but held out to book their place in Friday’s semi-final. In the 4th minute, Watergrasshill attacked up the left and Sean O'Leary got in behind to pull the ball back into the path of Dorgan who swept it home from eight yards or so. It was a good start for Dorgan but he would have quite a lonely morning upfront as Blarney Street piled on the pressure after the goal. They came close to scoring in the next minute when Ger Cronin sent Colin McKeown in but keeper John O'Keeffe made the first of many good saves. Still, there was no great danger again to the Hill goal, until the injury enforced departure of Moss O'Keeffe. 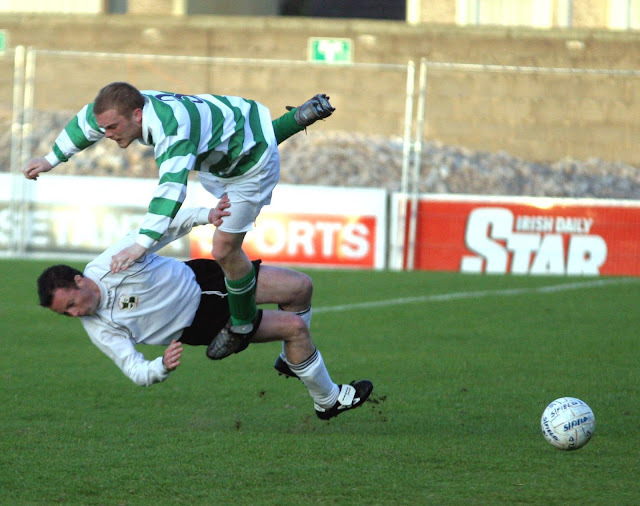 Five minutes later, Coughlan played Gary Kerrigan in but keeper O’Keeffe again made a fine stop. Seven minutes into the second half, O’Keeffe made a great save from a snap shot by Mark Bennett and then Coughlan missed from close in before sending over a couple of potent crosses that weren't availed off. Hill soon made their defensive change and full back O’Callaghan enjoyed a purple patch. But Hedderman scuffed his shot when clean through and then an O’Callaghan cross was just too far ahead of Dorgan. The hard-working Cronin thought he’d equalised for Blarney Street in the 64th minute but his header was taken off the line by Morgan Foley. O’Callaghan provided regular relief for the visitors but crosses, in the 66th and 65th minute, was just a few feet ahead of O’Shea and then of scorer Dorgan. The impressive Owen Cremin got through on the left for the Street but his dangerous cross was well taken by the under pressure keeper. The Street forced three corners in injury time and the third, by Cronin, was bravely claimed by keeper O’Keeffe and soon the final whistle blew. Blarney Street Athletic: Jason Downey, Owen Cremin, Roy Halloran, Garry Kerrigan, Denis O’Sullivan, Wayne O'Leary (captain), Ger Cronin, Mark Bennett, Gary Coughlan, Colin McKeown and John O’Riordan. Sub used: Vince Thompson for Cremin (82nd minute, injured). Watergrasshill Utd: John O’Keeffe, Morgan Foley, Kieran O’Callaghan, Moss O’Keeffe, Willie O’Leary, Kieran Foley, Billy Hedderman, Kieran Coakley, Donal O’Shea, John Dorgan (captain) and Sean O'Leary. Subs used: John Barton for M. O’Keeffe (34th minute, injured) and Niall O’Riordan for Dorgan (90th, injured).